Berkeley Lab scientists have long championed the development of the Sanford Underground Research Facility in Lead, South Dakota, with experimental facilities housed almost 5,000 feet below ground in the former Homestake Gold Mine. The Sanford Lab is owned by the state and its operations are supported by the U.S. Department of Energy’s Office of Science, under the leadership of Kevin Lesko of Berkeley Lab’s Physics Division. Many other Berkeley Lab scientists continue to play key roles in experiments currently underway and proposed. The news release below announces the Sanford Lab’s first scientific results. This release and additional materials are available on the Sanford Lab site at http://sanfordlab.org/news/press-releases. LEAD, S.D. – After its first run of more than three months, operating a mile underground in the Black Hills of South Dakota, a new experiment named LUX has proven itself the most sensitive dark matter detector in the world. “LUX is blazing the path to illuminate the nature of dark matter,” says Brown University physicist Rick Gaitskell, co-spokesperson for LUX with physicist Dan McKinsey of Yale University. LUX stands for Large Underground Xenon experiment. Gaitskell and McKinsey announced the LUX first-run results, on behalf of the collaboration, at a seminar today at the Sanford Underground Research Facility (Sanford Lab) in Lead, S.D. The Sanford Lab is a state-owned facility, and the U.S. Department of Energy (DOE) supports its operation. The LUX scientific collaboration, which is supported by the National Science Foundation and DOE, includes 17 research universities and national laboratories in the United States, the United Kingdom, and Portugal. LUX has a peak sensitivity at a WIMP mass of 33 GeV/c2 (see additional information, below) with a sensitivity limit three times better than any previous experiment. LUX also has a sensitivity that is more than 20 times better than previous experiments for low-mass WIMPs, whose possible detection has been suggested by other experiments. Three candidate low-mass WIMP events recently reported in ultra-cold silicon detectors would have produced more than 1,600 events in LUX’s much larger detector, or one every 80 minutes in the recent run. No such signals were seen. In both theory and practice, collisions between WIMPs and normal matter are rare and extremely difficult to detect, especially because a constant rain of cosmic radiation from space can drown out the faint signals. That’s why LUX is searching for WIMPs 4,850 feet underground in the Sanford Lab, where few cosmic ray particles can penetrate. The detector is further protected from background radiation from the surrounding rock by immersion in a tank of ultra-pure water. “This supremely quiet environment substantially improves our ability to see WIMPs scattering with xenon nuclei,” says Gaitskell. At the heart of the experiment is a six-foot-tall titanium tank filled with almost a third of a ton of liquid xenon, cooled to minus 150 degrees Fahrenheit. If a WIMP strikes a xenon atom it recoils from other xenon atoms and emits photons (light) and electrons. The electrons are drawn upward by an electrical field and interact with a thin layer of xenon gas at the top of the tank, releasing more photons. Light detectors in the top and bottom of the tank are each capable of detecting a single photon, so the locations of the two photon signals – one at the collision point, the other at the top of the tank – can be pinpointed to within a few millimeters. The energy of the interaction can be precisely measured from the brightness of the signals. 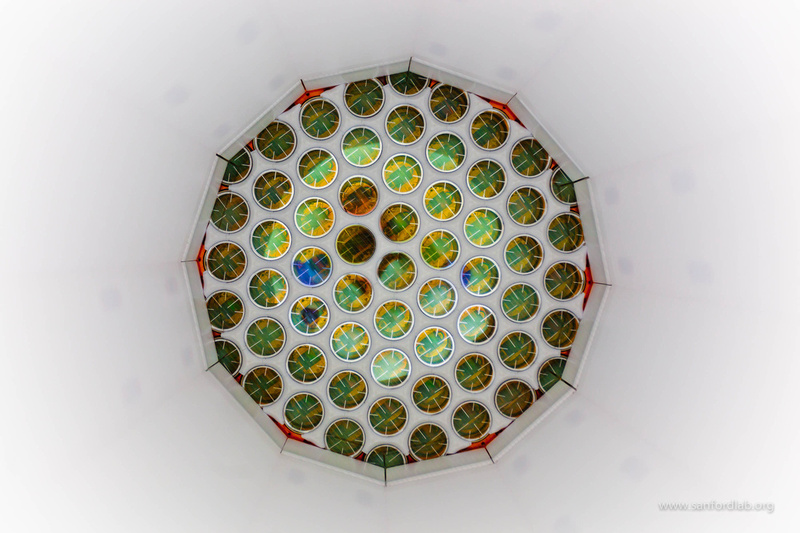 LUX’s biggest advantage as a dark matter detector is its size, a large xenon target whose outer regions further shield the interior from gamma rays and neutrons. Installed in the Sanford Lab in the summer of 2012, the experiment was filled with liquid xenon in February, and its first run of three months was conducted this spring and summer, followed by intensive analysis of the data. The dark matter search will continue through the next two years. South Dakota Gov. Dennis Daugaard says his state is proud to play a role in this important research. Homestake Mining Co. donated its gold mine in Lead to the South Dakota Science and Technology Authority, which reopened it in 2007 with funding from the state Legislature and a $70 million donation from philanthropist T. Denny Sanford. “We congratulate the LUX researchers, and we look forward to working with dark matter scientists and other partners in the years to come,” Daugaard says. The LUX announcement is a major step forward for the Sanford Lab’s science program, which Laboratory Director Mike Headley points out has its roots in a famous physics experiment installed in the same experiment hall in the 1960s. Planning for the next-generation dark matter experiment at the Sanford Lab already is under way. Compared to LUX’s third of a ton of liquid xenon, the LUX-ZEPLIN, or LZ, experiment would have a seven-ton liquid xenon target inside the same 72,000-gallon tank of pure water used by LUX. Case Western Reserve University physicist Tom Shutt, spokesperson for LZ and a previous co-spokesperson for LUX, says one goal of LUX was to figure out how to build an even larger detector. LUX and LZ are among 14 active research groups at the Sanford Lab, including the MAJORANA DEMONSTRATOR collaboration, which is looking for one of the rarest forms of radioactive decay in an experiment hall adjacent to LUX. Other teams of researchers are planning experiments in physics, geology and biology that could extend the future of the lab for decades. The example given above is a WIMP mass of 33 GeV/c2. Physicists express the mass of subatomic particles in electron volts (eV) divided by the speed of light squared (c2 ) A giga-electron volt (GeV) is a billion electron volts, or about the mass of a proton. More about Berkeley Lab’s role in LUX and LZ can be found here. The Sanford Underground Research Facility’s mission is to enable safe and compelling underground research and to foster transformational science education. For more information, please visit the Sanford Lab website at sanfordlab.org.